Wow! What a few week’s it’s been here at Litecraft HQ. Whilst most of you are gearing up for Spring our Marketing team have been busy drafting up our most adventurous new lighting campaign yet. 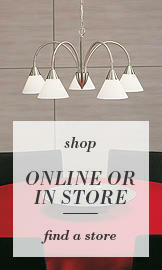 If you’ve been following us on social media, you’ll have probably got wind of our latest new lighting arrivals. Our Heritage Ceiling Range landed in January and we couldn’t wait to share the new range with you. We gave you a sneak-peek of the new collection through our blog posts, but what we didn’t tell you was our exciting photoshoot opportunity. Litecraft’s newest product portfolio was photographed at the iconic Victoria Baths in Manchester. It’s no surprise why we chose this beautiful establishment for our new lighting collection. The traditional Manchester red brick, the Art Nouveau stained glass windows and the peacock green tiles are just a few of the beautiful features we fell in love with. 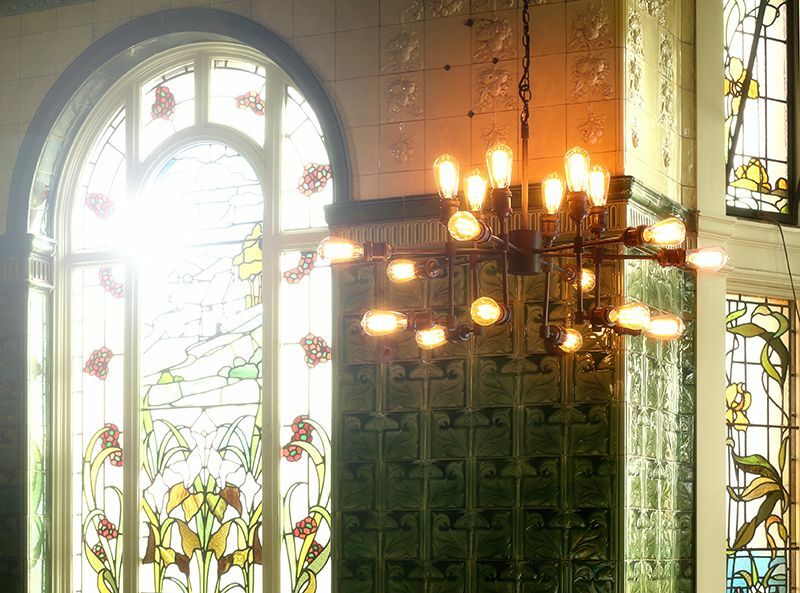 One of the key features of the Victoria Baths is it’s lovingly restored stained glass windows that can be found throughout the establishment. The Aerotone room also features exposed brick walls as well as a grandiose Edwardian framed area with more stained glass detail and rich wood panels. It’s this section we chose as the backdrop to our spectacular new lighting fitting, our Orbital Gyro Inspired ceiling pendant. This magnificent piece is a mesmerising structure that will give any home it’s pièce de résistance. 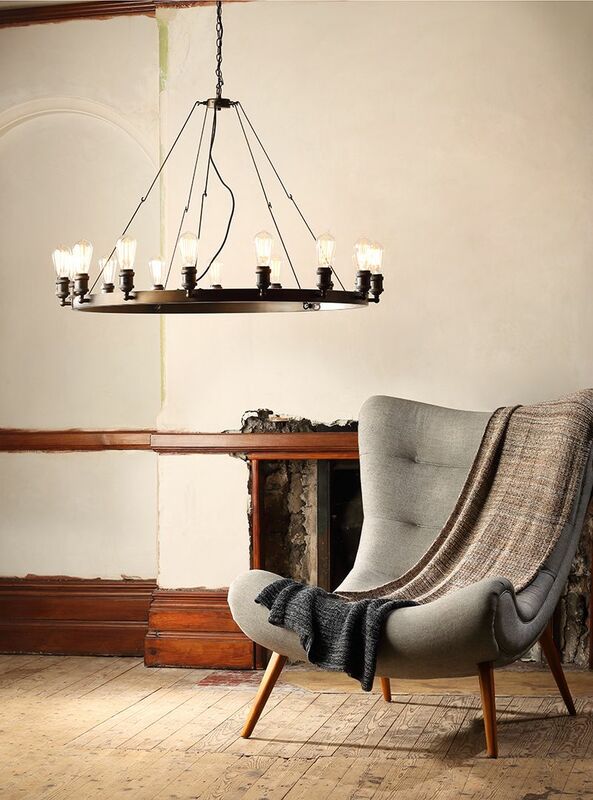 A show-stopping design combining candelabra features together with industrial accents. 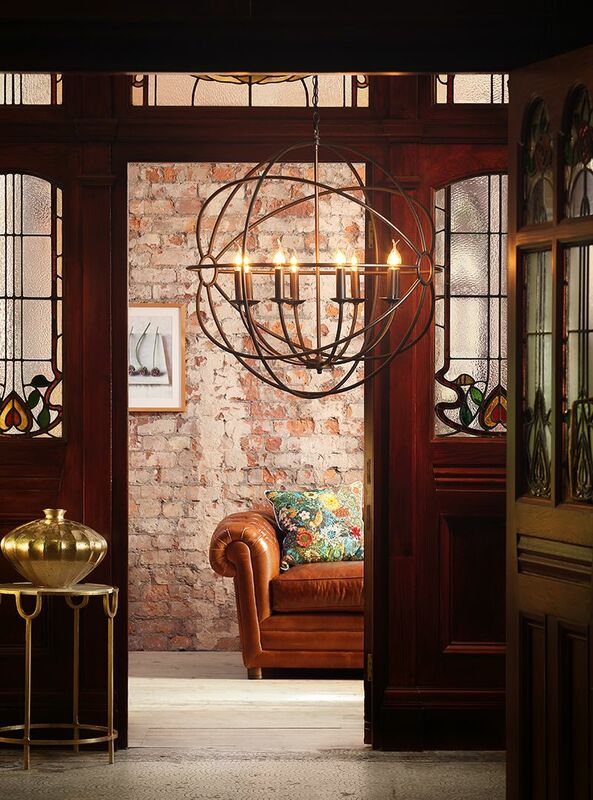 A rust effect finish and exposed bulb design captures the essence of industrialism whilst the gyro inspired sphere allows this piece to look great in any interior style whether it be a modern and contemporary setting or a more rustic home. Without a doubt the room that shows off an abundance of character and charm and arguable the prettiest room in this iconic building must be the Turkish Rest Room. Peacock green tiles fill the room from floor to ceiling whilst four beautiful stained-glass windows, including an impressive Angel of purity design, give a natural yet colourful light to the room. It was in this room we photographed our most show stopping fitting from the Heritage Collection. 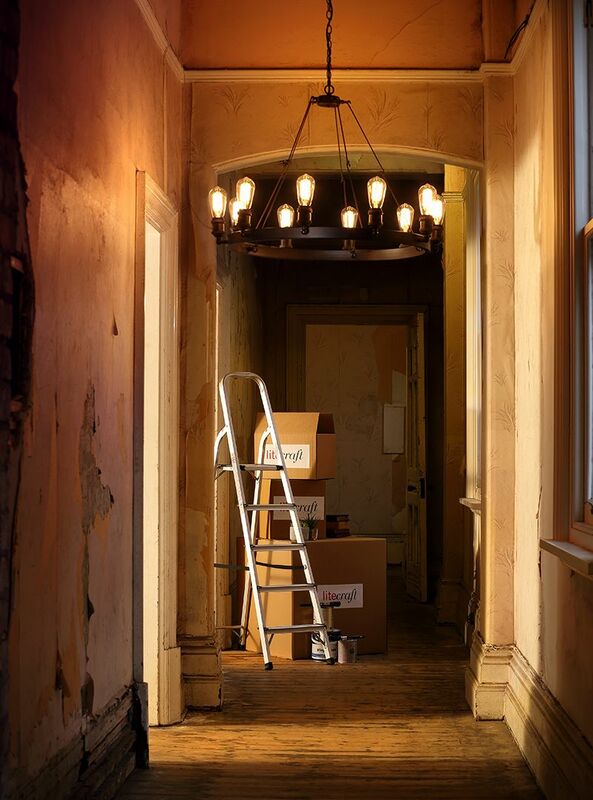 Our Heritage Steamer 18 Light Industrial Pipe Style Ceiling Pendant, an array of rust finished pipes stretch out into a maze-like feature with 18 exposed filament bulbs finishing the industrial look. This large fitting gives an expanse of light when lit due to it’s many bulbs. We’d recommend installing this masterpiece in a high-ceilinged room or hall way for optimum impact. 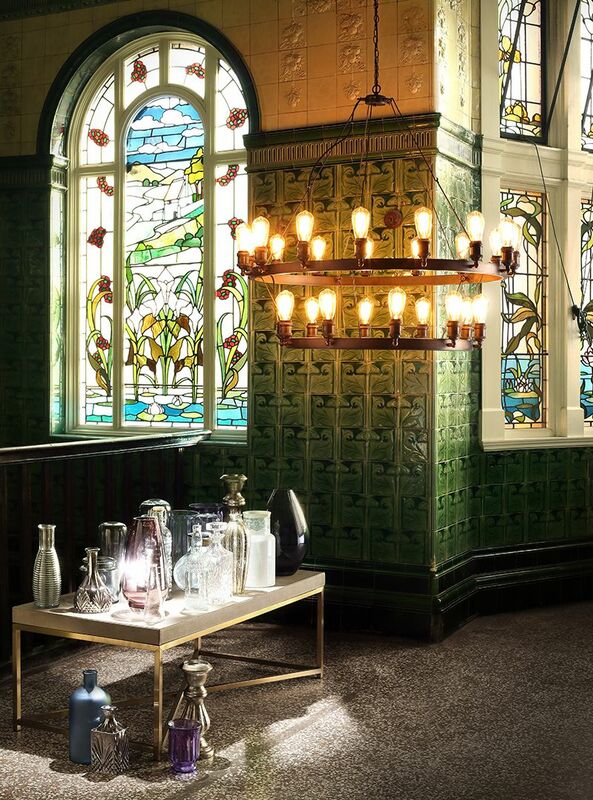 The team took advantage of the beautiful stained-glass windows and glazed green tiles found in the rest room for our next selection of Heritage designs. 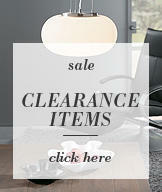 In particular, our Carter 25 Light Cartwheel Range. 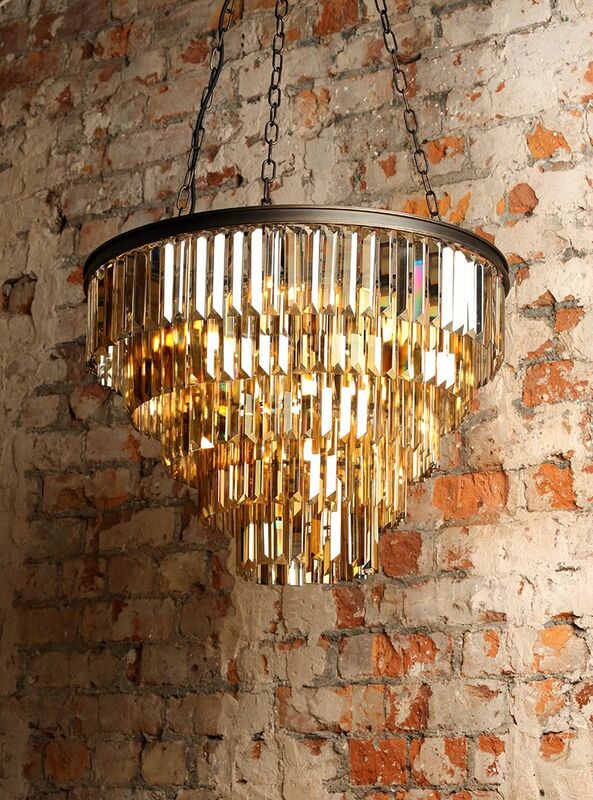 This stunning fitting features an industrial cartwheel design together with an exposed bulb element. The industrial inspiration behind this piece works perfectly with the Victorian design of the Bath’s interior. The raw and roughness of the bulbs together with the rust metal finish captures the nostalgic industrial conditions of the Victorian era perfectly. The character-full Committee Room, part of the Superintendents flat, was chosen for the setting of our Carter 15 Light Pendant. Taking advantage of the high ceilings and airy spacious walls, a simple shot of the pendant together with a mid-century style chair was enough, keeping the fitting as the central shot. 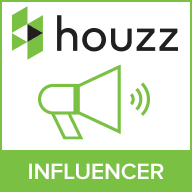 The flat comprised of four bedrooms and housed the Superintendent and his family from 1945. There’s talk of the rooms in the flat eventually being converted into accommodation in the not so distant future. There’s something about prism cut glass, maybe the way the light bounces off each sculptured corner when lit. What we do know is that our customers can’t get enough of these beautiful crystal forms. Our core Prism bar range in Satin Chrome and smoke has been one of our best-selling lines over the last few years. So, when it came to design a new range, our in-house design team decided a new prism bar range was needed. Something with an industrial twist that would resonate with our more vintage and industrial loving customers. Introducing to you our new Ingot Prism Glass collection, we’ve kept the overall prism design but introduced a more rustic metal finish which gives a warmer ambience. Furthermore, we’ve chosen a warmer gold tone for the actual glass which when lit produces a lovely welcoming and cosy glow. As well as the terracotta brick exterior the baths has a maze of corridors boasting beautiful exposed brick. We took advantage of the warm tones of the brick work when shooting the Ingot Range. Choosing the intriguing yet stunning Aerotone Room for this collection. Shot against the orange and clay brick backdrop is our Ingot 10 Light Crystal Prism Pendant. A picture of industrialism if ever we saw one. The gold tint of the glass perfectly compliments the orange terracotta tone of the exposed brickwork, creating a warm ambience and emphasizing how well this line works against a more industrial backdrop. We’re so grateful to the team at Victoria Baths for allowing Litecraft to shoot our latest product portfolio in their iconic building. We loved the finished look of each shot, capturing the true essence of industrialism in this range, we hope you do too.